Brera is a bohemian neighborhood in central Milan that is always full of life and movement. It's full of small shops and restaurants in a cosy Italian atmosphere. The neighborhood consists of narrow streets and small alleys and the car traffic is as good as non-existent—it’s the crowds of people who create a lovely buzz instead. The restaurants offer everything from pizza to seafood and you'll also have the opportunity of tasting the classic Risotto alla Milanese. If you've just arrived in Milan and would like to quickly find a restaurant in the evening, you're very likely to get help in Brera. Inside the centre of Milan's Il Duomo there's a large, incredibly beautiful Gothic style cathedral. This cathedral took about five hundred years to build and is the world's third largest, after the cathedrals in Rome and Seville. It's free to enter the Duomo, but buying a ticket to get up on the roof via the stairs or the lift is also possible. Even though it's a bit pricy, it's definitely worth going up on the roof to get a view of the whole city of Milan and get to see the Alps in the north during clearer days. Il Duomo is located in Piazza Duomo in the middle of Milan and there are lots of other things to discover around the square. 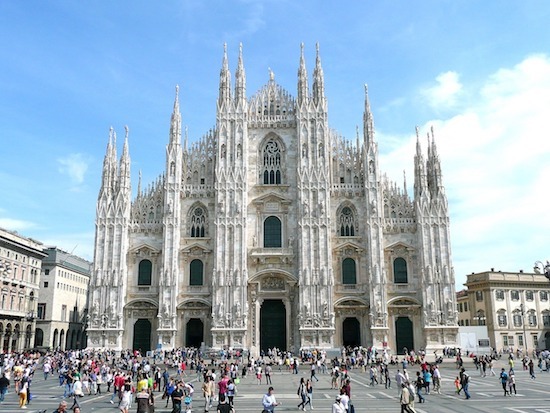 Clothing stores, ice cream parlors, restaurants, fast food chains and much more are just a few steps from the Duomo. The artist and universal genius Leonardo Da Vinci projected during the late 1400's the canal system of Navigli Lombari in Milan, which made it easier to transport heavy marble to the cathedral of Il Duomo. The canal system still remains to this day and Navigli is a popular place for both Milaneses and tourists. Navigli can be compared to a miniature Venice with its restaurants, cafes and small shops along the canals, which all make for a really pleasant visit. The whole surroundings of the channels are very special, and Navigli is something that just cannot be missed while visiting Milan. An evening visit combined with a delicious Italian dinner could be one of your best memories of Milan. Anyone who is looking for an exclusive shopping experience, or just wants to observe one of the fashion districts of Europe, should head off to the Golden Triangle. The Golden Triangle consists of the streets of Via della Spiga, Via Sant'Andrea and Via Montenapoleone, all of which are full of shops with well-known fashion brands such as Dolce & Gabbana, Gucci, Prada, Louis Vuitton, Versace and Ralph Lauren. Fashion is not the only aspect that is exclusive; the decor of the stores is also extraordinary. San Siro, with its 85,000 seats, is one of Italy's grandest football stadiums and this is where Milan's two football teams AC Milan and FC Internazionale play their home games. It's definitely possible to go and see these teams play as a tourist in Milan for a pretty affordable price. Football is considerably cheaper in Italy than it is in England for example, and tickets range from 15-20 euros and upwards. If you decide to go and see a game you should buy tickets outside the San Siro earlier during the day or on the day before, since it gets very busy just before the matches. Milan and Inter are among the best football teams in Europe and you're guaranteed to see some world class football if you choose to go to a game. Even on days when games aren't being played, you can experience football by visiting the Football Museum located by the San Siro. Here you can learn a lot about Italian football and also about former players of the Milan and Inter teams. A live show at the famous La Scala Opera House is a fantastic experience, whether or not you like opera. La Scala was built in the 1700s and this is where many of the great opera figures made their debut. La Scala is located in a beautiful square with the same name, and outside there's a monument to the memory of Leonardo Da Vinci. Tickets can be purchased onsite or online, but be aware that the shows are very popular and tickets sell out quickly. Usually you have to book at least a month in advance. If you want to avoid having to look for the right subway station to get off when visiting one of Milan's sights, it might be a good idea to hop on one of the city's get off/get on buses. It is definitely very "touristy", but at the same time very practical. There are three different routes in total that stop at all possible destinations around the city. One of the routes for example goes all the way to San Siro's football stadium. The advantage of this in comparison to the subway is that you can follow the life of the Milan streets from the seats on the roof of the bus. The amusement park of Europark Idroscalo is a nice place to visit when you want to take a break from the central parts of Milan. The park is Europe's largest and there are certainly enough attractions to entertain people young and old for hours. There are flume rides, a haunted house, go-kart track and classic rollercoasters. The park is open during March to September from 9 am to midnight, and visitors are welcome every day of the week. During the other months of the year, the park is only open at weekends. Europark Idroscalo is outside Milan i Segrate and you can easily get here by train or bus. Those who appreciate action-packed experiences should visit the Parco Avventura, which is an exciting adventure park perched among the tree tops. Visitors will be able to go through an obstacle course in the air, with everything from suspension bridges to cable cars. There are three different difficulty levels and the easiest course is ideal for children, while the hardest is better suited for adults. It's possible to visit the park with the whole family, regardless of age, and there are staff onsite to guide and assist visitors. Castello Sforzesco is Milan's large castle located in the southern part of the Parco Sempione. The castle was built by Francesco Sforza in the 1400s and was expanded in the 1500s and 1600s. Inside the castle there are currently several museums and, among other things, you’ll find Michelangelo's last sculpture, ancient musical instruments, and a variety of objects that have long been at the Castello Sforzesco. The Castle yard is also a nice place which is like a small park where you can stop to view the architecture or just sit down and take it easy. After wandering around the streets of Milan, it may be time for a little relaxation in the greens. Quite possibly the most popular park in Milan's Parco Sempione is located right downtown and spreads over 386,000 square metres in total. Here you can lie down on one of the park's lawns and relax or wander around the different walkways. There are cafés, restaurants and several galleries and museums in the park that you can visit. If you have children who need to get rid of some excess energy, there are also playgrounds where they can enjoy themselves. Acquario Civico is an aquarium located on the eastern edge of the Parco Sempione. As a visitor at the Acquario Civico you can see several different fish and other marine creatures—mainly from the Italian coast, lakes and rivers, but also from other parts of the world. The surroundings in the different aquariums vary widely to mimic the different ocean vegetation that the various fish live in. The aquarium isn't that big so you'll have time to see most of it in just over an hour. It’s open Tuesday to Sunday and entrance is completely free. You should however keep in mind that it's closed for lunch between one and two in the afternoon. Museo della Scienza e della Tecnologia Leonardo da Vinci was opened in 1953 by the former president Alcide De Gasperi and has expanded over the years to become Italy's largest science and technology museum. The museum is dedicated to Leonardo da Vinci and much of what is on display is related to his discoveries within engineering and science. There are also a lot of new things to explore and the museum follows the developing timeline from past to present. Among other things, there is a large modern submarine and an aircraft that you can look at. Even if you're not hugely interested in technology and science, you'll most likely appreciate what the museum offers since everything on display is as much about history as it is about social development. Museo della Scienza e della Tecnologia Leonardo da Vinci is suitable for all ages—there are plenty of things to see and do, even for the smallest children.